Another 2-hour stint. This time after a week spent in bed with acute bronchitis. Not fun. I am still very tired and wheezy, so tried not to do too much or get too cold. Not sure I achieved either. The site’s soggy and the main path to my plot is starting to get very slippy. Only a couple more months of this and we’ll be on the upturn and racing to get plants/seeds into the ground. Staked and netted the kale, using some of the blackthorn from last year’s hedge trimming. One small sentence, so much time! Most of the leaves have been totally shredded so I hope staking will help them recover and I’ll get something of a picking or two before I pull them up to make way for the potatoes. The shallots are also newly weed-free. All but one are up. Unfortunately I pronged the one that isn’t up but was just lurking under the surface. Whoops. 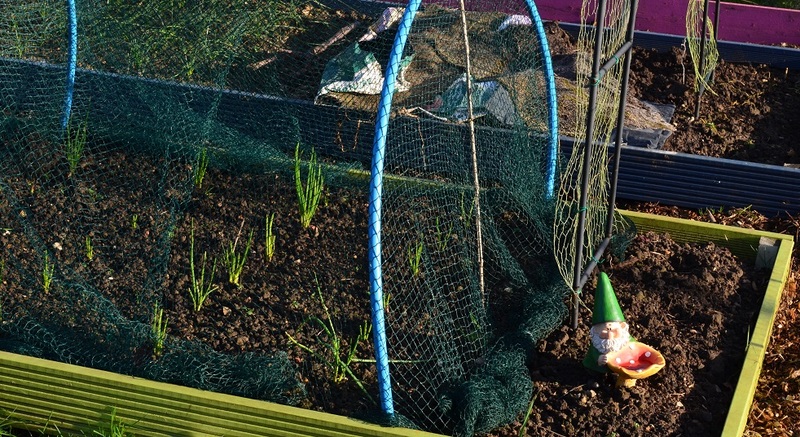 My new (and hopefully only) gnome, Gareth, has been installed on the plot. The Aquadulce broad beans are really tall and are going a bit floppy. Will see what happens with them, but at some point soon I think they are going to need stakes too. This year’s seed potatoes have arrived nice and early and are chitting in the kitchen. Despite their early arrival I’m not as impressed with DT Brown as with Suttons last year so I won’t be going back. The Charlottes are either huge or 2.5cm by 2cm. One of the Lady Christl’s was rotten, though they are a bit more consistent size-wise. Some £land Pentland Javelins have fallen into my sticky hands too. Knew I wouldn’t be able to resist! It does mean I have enough tubers to try for an early crop in bags – the plan is planting those in late February and keeping them out of the cold. 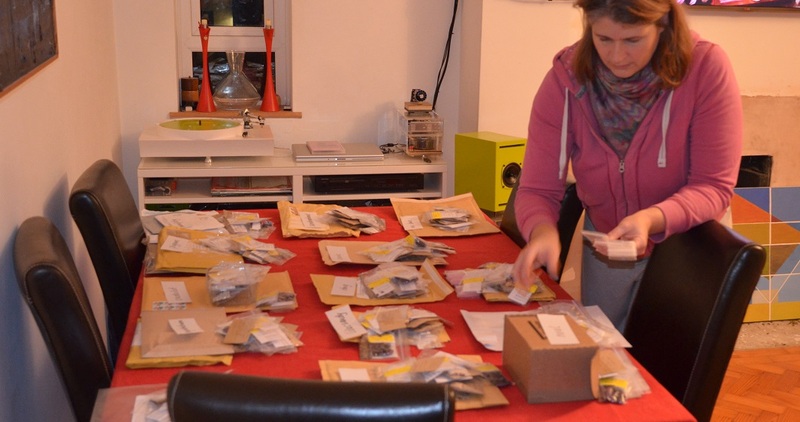 The seed circle parcels are sorted, sealed and ready to go out for a January Seedmas. It took a while to do but was really satisfying. There are a few spares and these can go in the next round of Pass the Parcel. 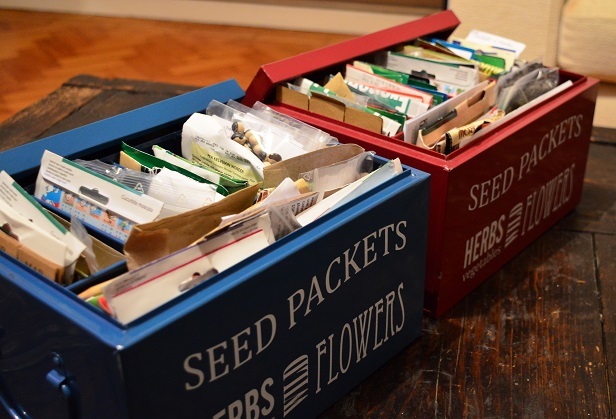 I’ve also sorted through all my seeds. And the collection has grown to 2 LARGE boxes brimful of packets – one has cucurbits and beans, the other has everything else. But, in doing it I have cracked. The propagator is fired up and I’ve filled it with facing heaven chillies. They are old seeds, so I figure they may need longer to come up and also I have nothing to lose. Obviously I picked the coldest week of the year so far to do it. This week’s photos are from my new toy – I’ve got Piero’s Nikon D5100 and he’s upgraded. Now I just need to learn how to use it properly, but it’s a relief not to have to use my ancient phone anymore.